The sciatic nerve is collection of several nerve roots that arise between your spinal bones (vertebra). These nerve roots join together and form the largest nerve in the body, the sciatic nerve. This nerve travels down from the low back under the buttock muscles all the way down the legs and feet. Sciatica is a term to describe an irritation of pressure on the nerve, which is commonly caused by a herniated or bulging disc (also referred to as a ruptured disc, pinched nerve, or slipped disc) in the lumbar spine. The pressure or irritation leads to a complex of symptoms that include sharp, radiating pain, burning, and/or numbness and tingling. This is a very debilitation condition that affects thousands of people every year. Generally, herniated or bulging discs are the cause of the problem. The herniated material of the disc will compress or contact the exiting nerve root producing the symptoms. 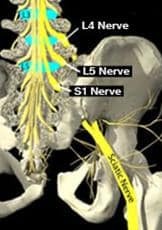 Sometimes central canal stenosis, lateral canal stenosis, spondylolesthesis, or degenerative disc disease can cause this nerve compression as well. The problem is often diagnosed as “radiculopathy”, meaning that one or more intervertebral disc have herniated or protruded from its normal position in the vertebral column. Thus it is putting pressure on the nerve root in the lower back, which forms part of the sciatic nerve. Sciatica occurs most frequently in people between 30 and 50 years of age. On many occasions this condition slowly develops as a result of general wear and tear on the structures of the lower spine and discs. Rarely is this condition surgical. Unless there is a progressive neurological deficit, or cauda equine syndrome, the majority of people who experience sciatica get pain relief with non-surgical treatments. Our exclusive method is very effective for these conditions. Physical therapy and Chiropractic can help sometimes as well. Weakness, numbness or difficulty moving the leg or foot, with the leg pain being a little worse than the back pain. While sciatica can be very painful, it is important to keep in mind that the main problem may be with the intervertebral discs. Most likely the discs are dry and weakened due to “wear and tear” injuries. Treatment goals should be to minimize pain, minimize the disc herniation, re-hydrate and re-nourish the discs and nerve roots, and to strengthen and rehabilitate for permanency and prevention of re-injury. This is where Dr. Campbell’s method can be very effective. Symptoms that may constitute a medical emergency include progressive weakness in the leg or bladder/bowel or incontinence. As mentioned above, this may represent a rare condition called cauda equine syndrome. You should seek immediate medical attention if you are experiencing these signs. Non-Steroidal anti-inflammatory drugs (such as ibuprofen, naproxen, or COX-2 inhibitors), or oral steroids can be helpful in reducing the inflammation and pain associated with sciatica. The goals of non-surgical treatments should include both relief of sciatica pain and prevention of future sciatica problems. Injections are invasive and are usually only a temporary solution. When reading the medical literature, it is generally agreed upon that nearly all cases do well with non-surgical management. Microdiscetomy or lumbar laminectomy and discectomy, remove the portion of the disc that is irritating the nerve root. This surgery is designed to help relieve both the pressure and inflammation and may be warranted if the sciatic nerve pain is severe and has not been relieved with appropriate manual or medical treatments.